Holi is over and we hope that everyone had such a great fun with colors, foods & get togethers. Now it's time to get back to our routine life. But there is one problem that our skin we have got so many harsh chemicals which ruined the natural oils of our face & we got dry patches. 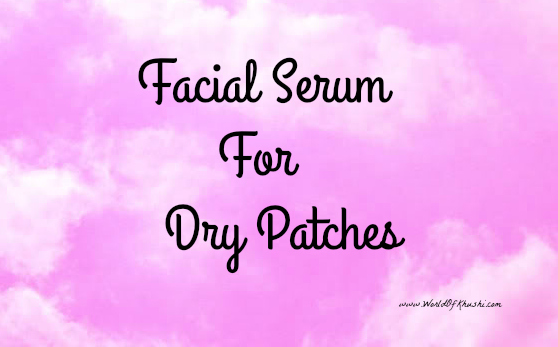 😟 Dry patches are not flattering at all, they make our skin rough, gives redness and sometimes itching too. Let's see how to make it! In clean glass bottle; mix all the ingredients. Mix them well. If you don't have glass bottle you can even use plastic bottle or spray bottle. Step 1. Begin with clean face! Take few drops in your hand and start rubbing the Serum in circular motion on your face. Step 2. Leave it for at least 1 hour. Step 3. Wash with cold or normal water and follow up with your favorite moisturizer. Use this on daily basis until you get back your normal skin. I personally like to apply it for 3 to 4 hours as my skin don't sweat a-lot. But, if your skin is very sweaty then don't apply for more than hour or two as it contains glycerin which can make you uncomfortable. 1. Always shake bottle before using, so that all the ingredients are mixed well. 2. Always do patch test as everyone's skin is different. 3. If you don't have Rosehip Oil you can even use Almond Oil. 4. After applying Serum don't go outside or in the Sun, as it contains glycerin which is little sticky & heavy on face. Glycerin nourishes your skin and lock the moisture. Rose Water has anti-inflammatory properties which helps to reduce the redness & irritation. Rosehip oil improves texture and pigmentation. Whenever I get dry patches I always use this homemade Serum. This works so good for me & I hope this will work for you guys too!! Do try this Serum & let me know your feedback. Remember people! your skin is already very dry and damaged because of Holi so don't scrub too much, be gentle with your skin. If you have any beauty request then do let me know. Don't forget to like the post & share it with everyone!! Follow me on Khushi's World Facebook Page, Google+, Instagram and Pinterest for more Posts. I will see you in next post till then take care.